Rich and Stange began life as an artist’s book about a found photograph. It then became photo-video installation presented at the Rencontres de la Photographie, Arles, 2016; and NOKS Independent Art Space Istanbul 5 May- 10 June, 2018. As the image world becomes electronic, paper photographs from the past drift about in search of new homes. Earlier this year I chanced upon a press photograph in a flea market. It was taken in 1931 on the outdoor set of a film shoot. The director was Alfred Hitchcock. The film was Rich and Strange. I turned the photograph into a book of the same name. Hitchcock was the master of suspense but photographs suspend in a very different way. They show but they don’t tell. They describe but they don’t explain. They are factual enigmas. Zooming in, the book picks out the seemingly endless details: African shacks, rickshaws, lily white movie stars from Europe, a nervous producer, a cameraman, scattered props. All in a field in Elstree, North London. 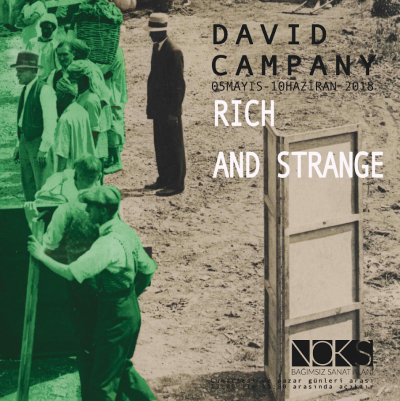 Rich and Strange is a homage to the materiality of photographs, to filmmaking, to abandoned archives and to the photographer who shot this image but whose name is lost.